In Doreen Virtue‘s popular Angel Tarot Cards deck, Jeremiel has been chosen to represent the Judgment card which is apt, since he is the angel of Divine Judgment in Orthodox Christianity. Judgment give us an Astrological correspondence with Pluto and a resonance with the Scorpio energies of the Death card. This is all spot on since Jeremiel of the Purple and Gold rays is also an angel of transmutation. Angelic transmutation of negative energy is always an act of mercy so perhaps now it becomes a little bit clearer why Jeremiel is known as the Angel of Mercy. Nobody needs mercy more than those who are dying (physically and literally). The personality clings strongly to the body/life (or thing) it claimed as its own. At times like those, you may wish to use the sigil shown here, which was given to me in a dream when my father in this incarnation was struggling with letting go. 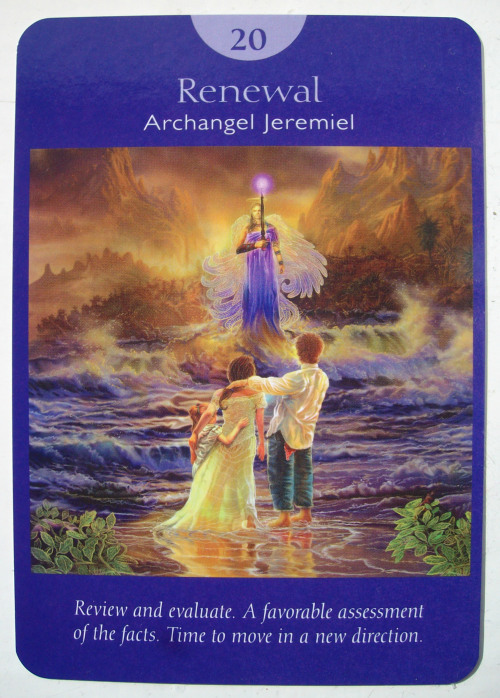 Succinctly put, Archangel Jeremiel helps us review the past so that the present can be transmuted (an act of mercy) and are free to move forward into the future fully aligned with Spirit in a state of grace. The Tarot spread above was created to help you connect with Jeremiel through the Tarot cards. He instructed me to create a spread without set card positions, so you will need to rely in the information that comes through intuitively in the form of three little ‘stories’ for each of the three rows. For those of you who are new to reading the Tarot cards this way, you will learn to put yourself in a receptive state and then allow the information to flow without worrying about individual card meanings. Rely on visual clues and your own gut feeling. If you find it difficult to become relaxed and receptive enough for the information to flow, you may want to experiment with changing the sounds, scents and lighting in your immediate environment. The bonus of reading like this, as opposed to with set positional meanings (where you rely on traditional card meanings) is that you will begin to notice quantum leaps in your psychic development as your third eye gets a very good workout in the process. Although you do not need to light patchouli incense and play Deva Premal softly in the background, I do strongly recommend that you light a candle invoking the assistance of Archangel Jeremiel before you begin your reading. The three rows present you with a past-present-future reading, focused on gaining spiritual wisdom and bringing the ego into alignment with Spirit. You will read the rows first but are then free to read columns and diagonals for further information. Personally, I like to end the reading by reading the top left to bottom right diagonal but you can stick to just the rows if you feel overwhelmed by too much information. As for the top row which concerns the past, you will get a clue that it may concern a past life if one (or more) of the following cards are present: The Moon, The World, Wheel of Fortune, Justice or Judgment. Pay particular to Judgment and Death, as they are signals that Jeremiel is working very closely with you on whatever is represented by the card(s) before/and or after either of these two cards. Set a time-span for which period you wish this spread to cover before you begin the reading. You don’t need to worry so much about the past, as it may cover something that happened quite recently or something that happened many incarnations ago… but you will need some kind of focus for future timing. The middle row, aka the Mercy Row is the most crucial row in order for you to integrate the past, transmute any negativity and release whatever needs to be released. If you struggle with understanding of what is happening here, simply ask Jeremiel for guidance and write down whatever pops into your mind as you look at the images. ETA: I was told by Jeremiel that the number of cards is significant and serves as a reminder of 9 year cycles and pinnacles of learning.